Armed Forces Weekend Kicked Off Annual Fall Festival at the Great Pumpkin Farm in Clarence. The Great Pumpkin Farm’s Fall Festival is celebrating its 22nd year as Western New York’s favorite fall destination. Young and old who attend the Festival look forward to the thrill of the amusement rides, hayrides and corn maze, relish picking out their pumpkins, homemade donuts, pies, cookies and pastries, selecting the perfect Halloween decorations and watching special events, such as the World Pumpkin Pie Eating Contest, the Trebuchet Contest and Oinktoberfest, New York State’s BBQ Cook-off – and so much more! 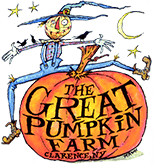 This year, the Great Pumpkin Farm declared opening weekend to be Armed Forces Weekend, in collaboration with WNYHeroes, Inc. The regular admission fee was waived for military, police or fire department personnel who were also permitted to bring one guest for free. A special happy hour took place at the Witches Brew (inside the Pumpkin Palace) on both Saturday, September 16 and Sunday, September 17. There was live music and military veterans served as bartenders. All tips collected were donated directly to WNYHeroes. Throughout the seven weekends of the Fall Festival, WNYHeroes representatives will be on hand at an informational booth in the Event Center at the Great Pumpkin Farm. In addition to Armed Forces Weekend activities, the opening weekend of the Fall Festival included animatronic dinosaurs, Vinnie and Teddy, in the Corn maze and Sylvia Fletcher & Friends Ventriloquism. On Saturday, September 16, the Buffalo & Erie County Public Library’s Bookmobile (Library on Wheels) was on site with crafts for the children and story times throughout the day. WEEKEND #7: October 28 & 29: – FINAL WEEKEND; Costume Contest; Dinosaurs in the Corn Maze. More information on Weekday and Weekend events can be found on our event calendar or by view our list of attractions.